Have you ever seen those long smoke-lines in the sky and wondered what they are? Some may be jet vapor contrails, but others are known as chemtrails. Most of the population doesn’t know, but these trails, loaded with heavy metals that have been measured in the water and air at several different worldwide locations, are actually a threat to your health. Contrails are the result of jet engine vapors condensing into tiny ice particles at high altitude. They are usually not very dense and evaporate quickly. They never extend from one side of the sky to the other, not even close! These trails are dense and linger, often from horizon to horizon, sometimes widening to form streaky clouds. As more have reported the chemtrail phenomena to government agencies, the usual cover story is that they’re being sprayed as part of a geoengineering effort to slow down global warming, or they’re conducting military drills with releasing streams of metallic particulates to confuse radar. They are cover stories. So what are they covering? Mainstream media thoroughly ignores or debunks it. Congressman Dennis Kucinich seemed to have caught wind of the hazards of geoengineering for weather control. He tried to into introduce a bill called the Space Preservation Act in 1997 and 2001, mostly intended to stop Star War projects. Within it the word chemtrails appeared as an item to be banned. The bill went nowhere. Most congressmen are ignorant of the issue or afraid to ask, just like the media. The denial of something so apparent is outrageous. 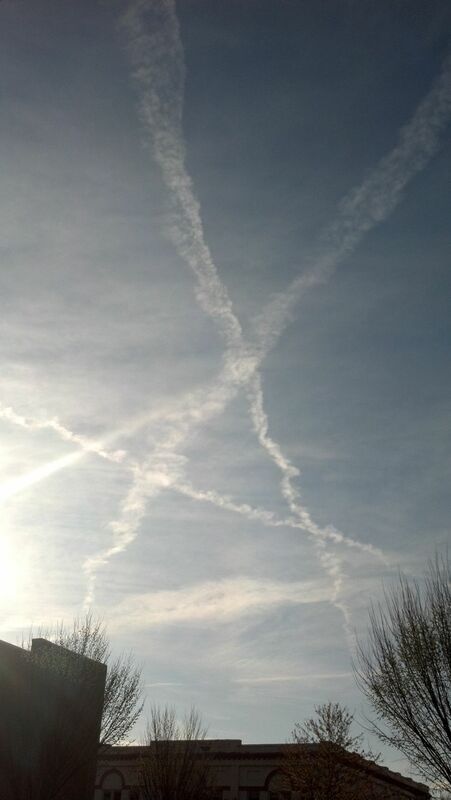 After looking into chemtrails for yourself, ask anyone to look up if you see them and watch them go into denial as well. Sometimes both contrails and chemtrails appear simultaneously, making it easier to differentiate. So now that we know they exist, it’s important to recognize the dangers of chemtrails. Readings taken after chemtrail episodes from air traps, water traps, ground and snow samples vary slightly from location to location, but they usually contain small particulates or nanoparticles of aluminum, barium, strontium, and sometimes ethylene dibromide or EDB, often called dibromoethane, an EPA banned fuel additive. Consider that these particulates fan out at high altitudes and fall onto the ground invisibly, affecting foliage, forests, crops, rivers and lakes, animals, and humans. Many aware conservationists and environmentalists are aware of the chemtrail damage to our biosphere. Breathing nanoparticles of toxic metals into the lungs bypasses our primary immune system’s defenses. These substances make their way into the blood directly from the lung’s capillaries. And aluminum gets through the blood-brain barrier. But don’t worry; Monsanto has patented aluminum resistant seeds. How did they know that was needed? Strange. Just a couple of years ago, an Arizona resident collected certified medical blood test documents from seriously ill Arizonians and sent them to various State and Federal elected officials demanding an investigation. The blood sample documents showed extremely high amounts of either barium or aluminum or both. None of those people worked or had worked with hazardous materials containing those items. Some were retired. In the past couple of decades, death from respiratory disease in the US have been increasing. Asthma rates have more than doubled in the western world and Alzheimer’s’ disease and autism spectrum disorders have risen dramatically. Barium can be linked to multiple diseases including respiratory diseases and aluminum to neurological afflictions. Even if you’re not directly affected by these nanoparticles from chemtrails, your immune system is adversely affected and forced to work overtime with yet more environmental and food pollutants and toxins, leaving you more prone to infectious and autoimmune diseases. And in any case, if the soil is affected (which it is) you are affected. There are many groups and individuals doing what they can to bring awareness to government agencies. But this operation’s lid is sealed. If you’re new to this and curious, start checking out those jet trails and notice the difference between contrails and chemtrails. You can Google chemtrails, aerosol spraying, or geoengineering for more resources and sites with photos and videos. Try to sidestep the usual debunking shills and trolls, but without disregarding all the information. It’s important to look at everything from multiple angles to get a better understanding. Despite all the efforts of individuals and small groups as well as documentaries, nothing gets done about this toxic elephant in the sky. So you have to protect yourself by detoxing often. A mineral water product called Volvic, available at Whole Foods and online, has been used to remove aluminum from the brain. The recommended regimen is 1.5 liters daily for five days. And there are other ways to remove heavy metals from the body, including professional chelation and do-it-yourself solutions. Consider consuming these 6 foods for heavy metal chelation or utilizing these 7 tips for detoxing and cleansing the body. Food grade activated charcoal is yet another detox agent that can be used.